Scribner Book Company, 9780743244343, 128pp. Ryland Falls wasn't paradise, but there was a certain storybook quality about the town that made visitors catch their breath. As in a book, the order of the stories never changed. On December first, the Chamber of Commerce always hung out the "Yuletide Greetings" banners, the plastic Santa Claus went back on the top of the firehouse roof, and grumpy Diane at Elwood's Market started wearing her set of imitation reindeer antlers. Yet on this particular Christmas, there were signs that the order of things would change. And when it did, the people in Ryland Falls never celebrated Christmas the same way again. The Christmas spirit is alive and well in this inspiring story about the redeeming power of the imagination and the true nature of compassion. Leif Enger author of Peace Like a River Giovanni's Light is like the timeless Christmas tales we were raised on -- tales of deep snow, desperate wishes, and rescued hearts. Phyllis Theroux fears neither familiarity nor sentiment but writes with timeless fluency and attention to truth, so that her fable gathers about it the shimmer of simplicity and strength. The Christmas in these pages is an event of wonder that deserves candlelight and cocoa and people who read aloud. Howard Norman author of The Haunting of L. Deeply affecting, written with offhand-seeming brilliance and compassion, Giovanni's Light is a Christmas dream of achieved realism. Phyllis Theroux succeeds in plaiting together a philosophy of art with real people's lives in a way that makes her book a small classic. Thomas Moore author of Care of the Soul Charming and universal, Giovanni's Light is a story of hope and the often forgotten fact that life can change, especially when nature is allowed to play a role. Benjamin Cheever author of Famous After Death You'll read this in one sitting. And when you've finished, the world will look fresh and new again, the way it used to look. Giovanni's Light is splendid. Read it to yourself. Read it to your children. 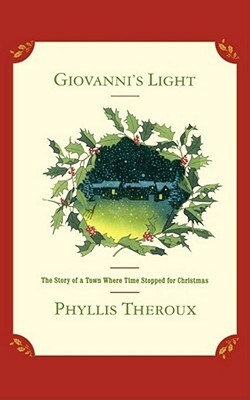 Sue Grafton author of P Is for Peril Reading Giovanni's Light is like being transported by magic into one of those miniature villages under an old-fashioned Christmas tree. Judith Viorst author of Imperfect Control This Christmas, and every Christmas, families all over America should be reading Giovanni's Light. Like It's a Wonderful Life, it offers enduring truths about connection and community. As always, Phyllis Theroux writes with a spare eloquence that speaks directly to the heart. Do I dare call her gentle fable an instant classic? You bet. The Reverend William Sloane Coffin author of The Heart Is a Little to the Left Giovanni's Light reminds us of the Divine wonder and beauty of ordinary things in the everyday world. Michael Korda author of Country Matters Giovanni's Light is a charming, lovely story, and the perfect Christmas "stocking stuffer."